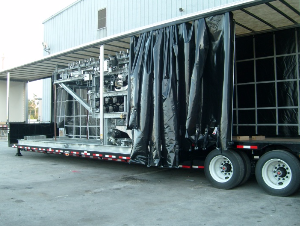 Specialty products in transportation equipment are notorious for being enclosed with a curtainside system due to the versatility that lends itself to the access of the machinery or cargo on the trailer. These projects are limitless with regard to the accommodation of specifications because Roland is staffed with a team of professionals that utilize their creativity along with the Roland ability to bring your concept into a reality. 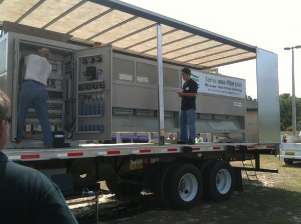 Specialty products we have included but are not limited to: Aircraft engine transports, Water Purification equipment, waste recycling equipment, poultry transporters, BBQ cook-off smoker trailer, show car transporter, trade show exhibit trailer, machinery and laboratory transporter, circus equipment transporter, bottled gas rack trailer / truck, camper shell transporter, glass rack trailers and the list could go on. If you can share the parameters and scope of your project, we can develop the solution that brings your idea into reality.